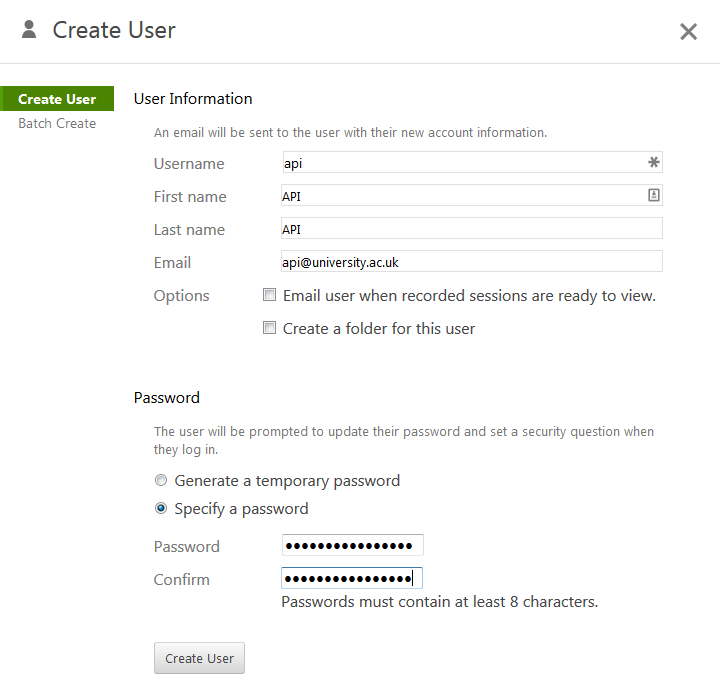 In this first example we’re going to connect to the Panopto server using a username and password. Once the user exists you will need to give it some permissions. You should give the user only the permissions it needs. If you are using a development server then I’d recommend making it an administrator when following these instructions. We now have a user that can connect to the server. Horray! This is all fine, but the reason to use C# is that it knows all the possible commands that Panopto accepts. So we need to add the services to our application. At the top of the console application to tell visual studio to expect commands from that namespace. You may have noticed when adding the service reference that Auth has a very small amount of commands within it (which is why I’ve used it first). One of those commands is GetServerVersion and we can use it now. This makes the command prompt window wait for you to type something in. It simply makes it so that the window doesn’t close a few milliseconds after you run your program. So how did I know that this command existed? 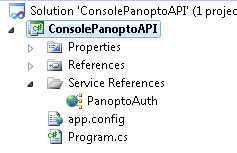 Well if you double click on PanoptoAuth in the Solutions Explorer you’ll see the commands that are available. You’ll also notice that GetServerVersion is under IAuth. Finally the structure above tells which object we need to make and the class of the object. You may have noticed that we define the sessionAuthInfo, but don’t actually use it in our GetServerVersion() command. This is because GetServerVersion doesn’t need authentication. What you should be aware of is that the API hasn’t actually checked your username and password works yet. Hi Graham, any chance the API has been extended to support REST? Do you know if it is possible to connect to the Panopto API in a simple way via the Postman app for example?